The British Treasury, along with Chancellor Philip Hammond, have hinted that the new 12-sided pound coin introduced into circulation in the United Kingdom in March 2017 may now be minted for the British Overseas Territories. This additional information follows the announcement by the treasury of Guernsey in October 2017 that more than £500,000 worth of Guernsey pound coins will be withdrawn from circulation in favour of circulating the new British one-pound coin. The British one-pound coin, originally released in 1983 and minted from an aluminum-bronze alloy was introduced into circulation in an effort to replace the banknote of the same denomination. They were recalled from circulation by the treasury in October 2017 due to the significant numbers of counterfeit coins discovered over the years. It was replaced with a bi-metallic version that went into production in 2016 and has been described as “the most secure coin in the world” due to its new security features which included micro-lettering and a holographic image. The reverse featured a floral collection, including the Northern Irish shamrock, Welsh leek, Scottish thistle, and English rose, along with the fifth effigy of HM Queen Elizabeth II first seen on British coinage in March 2015. 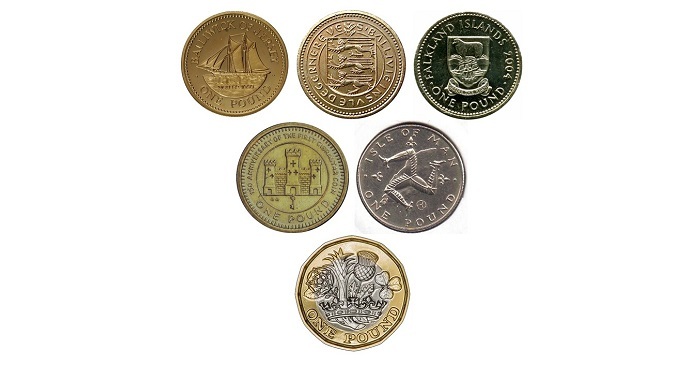 Similar versions with the same specifications as the British pound coins were shortly introduced into circulation in the overseas territories after 1983 whose currency is based on sterling. These territories, or crown dependencies, such as Gibraltar, the Falkland Islands, the Channel Islands of Guernsey and Jersey, and the Isle of Man retained their own version of the first pound coin after the United Kingdom changed over. However, the chancellor has stated that the new versions could be offered to these treasuries if they expressed their desire to introduce the coin into their economies. Additional overseas territories such as the Cayman Islands, Bermuda, and the British Virgin Islands do not base their currencies on British sterling but rather on the U.S. dollar and it is unlikely they will adopt the new coin for their own use. The government stated its territories would now have the option to produce their own 12-sided coin using the same cutting-edge technology to protect their own coinage against counterfeits. They added that the new versions of the coin would be designed to feature images celebrating the heritage of the territories, with their history and culture pictured on the reverse, while retaining an effigy of the Queen on the obverse. Previous version pound coins lost their legal tender status in October 2017, but remain redeemable by the British Treasury, holders of these coins are advised to exchange them at local post offices and commercial banks. Very interesting times for numismatics in the British Overseas Territories and Crown Dependencies. Gibraltar looks like the first to take up the option to issue the new style £1, announcing that there will be a Brexit commemorative £1 issued this year. The Channel Islands withdrew all old style £1 (UK and their own), demonetising them on 15 October 2017, and encouraged the continued use of paper £1 banknotes (which have retained popularity on the islands), to co-circulate with the new UK coin. The Isle of Man took a different route, not only retaining the “Round Pound” but even introducing a new definitive design, to co-circulate with the new UK £1. The island undertook an exercise to remove the old UK £1 though not demonetising those until 28 February 2018. In addition the island has kept the paper £1 note, though in practice this doesn’t see much use.